A brief article about actor Benedict Cumberbatch in Tuesday's Washington Post included a quirky name change that looked more like an iPhone autocorrect fail. A photo of what looked like a typo was tweeted by AFP photographer Alex Ogle, who seemed to come across the name change by AFP journalist Susan Stumme. 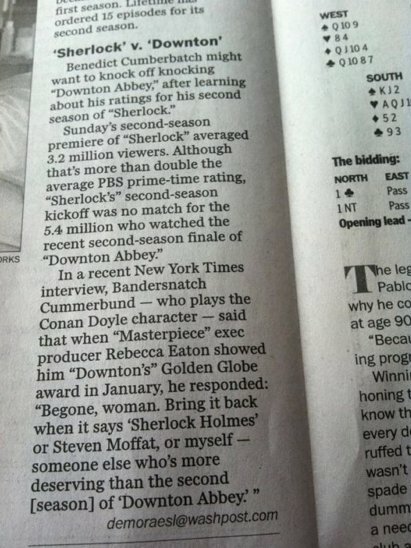 In both the print and online versions of an article about the PBS "Sherlock" star criticizing "Downton Abbey," Cumberbatch's name appeared drastically differently the second time it was mentioned in the article. Even though editors spelled his name correctly in the article's lede, Cumberbatch was later referred to as "Bandersnatch Cummerbund" in the third paragraph. UPDATE: The Washington Post clarified that the name change was in fact intentional and not a glaring error, as The Huffington Post originally reported. According to Poynter, "Washington Post senior social media producer T. J. Ortenzi says it was intentional, and we can expect to see something from de Moraes soon explaining the name choice."